Many of you have noticed that we've been doing an awful lot of digging on the driving range tee lately. What we're doing is digging up each sprinkler head and adding an additional sprinkler head. Here's a good picture of what it looks like after the additional sprinkler head has been added. So why do we need two sprinkler heads at each sprinkler head location? I can answer that with one word "control". Having control over where the water falls on the driving range tee is the key to good divot recovery and a luxury we've never had. That's one of the reasons the practice tee looked like this last summer. Of course last summer was a challenge like no other given the record dry, warm temperatures which meant difficult conditions for seedling survival, record numbers of rounds and excessive use of the practice tee. My fear is that last years perfect storm could easily happen again this year and it may even be the new normal. The bottom line is the condition of the tee was unacceptable last summer and the additional sprinkler heads will give us the control we need to make sure we never see that kind of condition again. Let me explain. 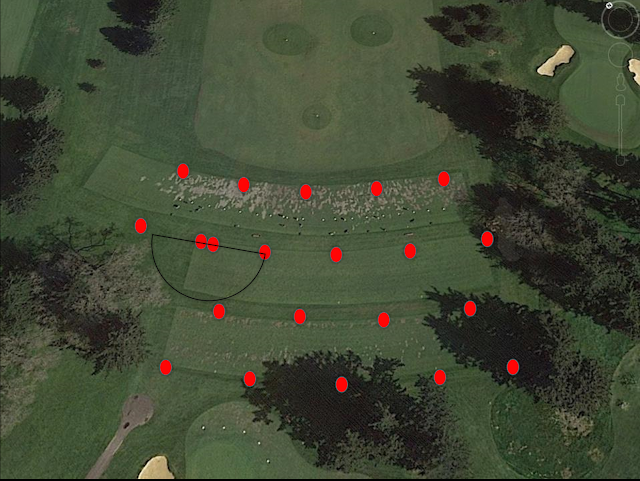 The above image is an aerial view of the practice tee and those red dots represent the sprinkler heads. The black circle represents the area watered by that sprinkler head. All of the sprinkler heads water in a full circle pattern so as you can see each sprinkler covers a large area. This is why it's so difficult to water the practice tee mid day without getting everyone wet. If we don't water the repaired divots in the middle of a hot day, the seedlings will dry out and die. If that happens then before you know it there is no grass on the practice tee. Now in this image you can see there is two red dots in that same location. The additional red dot represents the new sprinkler and you can see that this sprinkler's area of coverage is half as big as the other sprinkler. This type of sprinkler is called a "part circle" because it is adjustable to water less than a "full circle" sprinkler. With these part circle sprinklers we now can water just the areas that need water without closing down the tee and hopefully avoid getting anyone wet (honestly, one of you might still get wet). That is what we call "control" and that will be the key to ensuring the best turf conditions possible on the practice tee.